It must be odd winning a prize so many of your peers think shouldn’t exist. 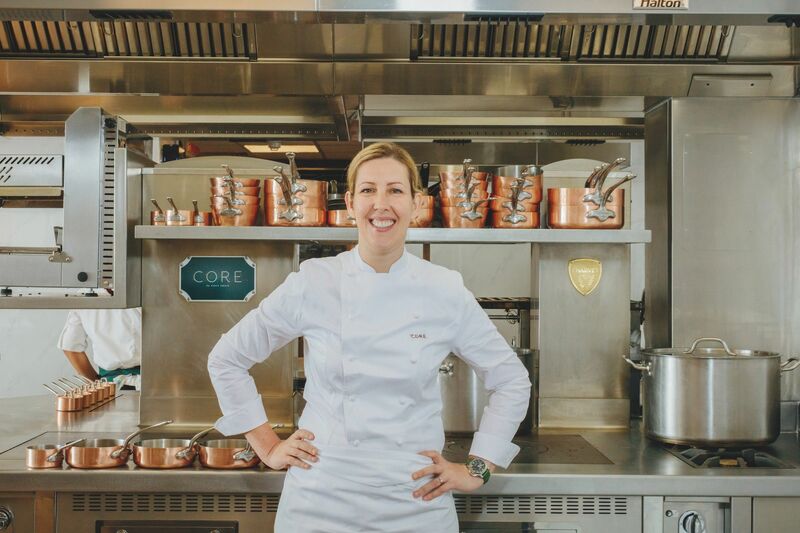 Clare Smyth, of the acclaimed London restaurant Core, was named top female chef at the World’s 50 Best Restaurant awards gala in Bilbao in June. While some chefs celebrated this new category, others objected to the idea that women should be separated from men, calling it variously ridiculous, outrageous, outdated and bizarre. Smyth—tall, blonde and poised—seems like an uncombative type. When I interviewed her on the first real day of autumn in London, she merrily chatted away about how the new season would influence her menu, which is famously vegetable based and focuses on local ingredients. Smyth herself fits neatly into the national stereotype, managing that tricky British balancing act of being both self-deprecating and self-assured. She is clearly passionate about her subject but is entirely lacking in the kind of arrogance successful chefs are famed for. And successful she is. Smyth left Northern Ireland, where she was raised on a farm, at 16 to train in England. She cooked under Heston Blumenthal and the Roux brothers, became the first woman to work in Gordon Ramsay’s kitchen and later became head chef of his Chelsea establishment, Restaurant Gordon Ramsay, losing her Northern Irish accent, maintaining its three Michelin stars and picking up an MBE along the way. His advice clearly worked for Smyth. Core has been open for just over a year and represents a perfect blend of Smyth’s classical French training and British artisanal influence. Think jellied eel with toasted seaweed and malt vinegar; foie gras parfait with Madeira jelly and smoked duck; Isle of Mull scallop tartare; and her personal favourite, potatoes with roe. The awards have flooded in. In October, Core was awarded two Michelin stars and scored a perfect 10 in the Good Food Guide 2019 edition. It was also named Top Gastronomic Experience in Harden’s London Restaurant Awards and the Automobile Association awarded it five of its prestigious AA Rosettes. And even Hollywood is calling, ever since Netflix announced that Smyth would represent the UK as an icon in its new global culinary competition show, The Final Table, which will air later this year. And then there is the minor fact that she oversaw the catering for royal couple Harry and Meghan’s wedding back in May, after the pair dined at Core and were delighted by what they ate. Much like the Duchess of Sussex, Smyth has strong views on women’s rights. And unlike those detractors who say a separate prize for female chefs does them down, she thinks it is essential. More than misogynist kitchens and the kind of open aggression her former boss was famous for, Smyth believes the imbalance is due to the terrifyingly long hours chefs are expected to work and the lack of family time that engenders. To help correct this, she only has eight services a week—five dinners and three lunches—ensuring her staff, both male and female, have a life beyond the kitchen. As important as that attitude is, it also means it is almost impossible to get a table at Core, which has famously turned down celebrities demanding to be seated at short notice. What could be more tempting than that?